I wrote this post two years ago but hesitated to run it because I knew a lot of people would rather not think about things like this. However, with so many precarious situations in our world right now and this being National Preparedness Month, I’ve decided to take this opportunity to bring some thoughts and ideas to you in hopes that they may prove to be helpful to your family should the need arise. 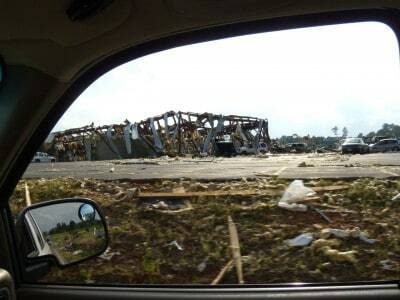 In 2011, when the tornadoes swept through my state, many people we know lost their homes and even loved ones. We only lost power. We were without power for a full week but forunately we were prepared. Fortunately, we didn’t need to get anywhere because gas stations, which ran on power, were closed. A few were open but the lines were so long and gas was being rationed. As a result, folks were cautioned they’d use more gas than they could get while waiting in line. Fortunately, we didn’t need food because grocery stores were closed as well, save for one that had registers hooked up to generators. Being the only one in town, by day two the shelves were mostly bare. Because of those countless natural disasters that have taken place over the past several years along with the tumultuous state of our world and economy, I wanted to write this post. This is for those who haven’t given much thought to preparing for a disaster or emergency in hopes of letting you know a few things to consider and some simple (low cost) ways that you can prepare to take care of yourself and your family should the need ever arise. This post is also for those who have wisely considered possible scenarios and continue to do so. Perhaps I will mention something that you have overlooked or vice versa. Iron sharpens iron and one of the best methods of being prepared I have found is to sit down and speak with like-minded individuals who have their eyes on the current state of affairs. This post is not meant to be used as a guide to preparing, but simple a starting point to help get you thinking about how to best prepare for your family. I am only sharing introductory steps here but will be happy to answer specific questions as fully and frankly as I can in the comments. If this is something that has been on your heart to do but you have not taken any steps yet, I suggest reading this post and then doing further research. There are countless books on disaster preparedness and, in my experience, not one single book will work entirely when it comes to your family’s individual needs. You are the only expert in that field. Think about this. With no power, no gas stations could operate. There were a few scattered ones but folks were urged not to go because the lines would be so long, you’d use up more gas driving there and waiting in line than you would be able to get (it was rationed out). Most grocery stores could not operate and all of their cold goods spoiled rapidly. One grocery store near us was able to operate because they were equipped to run their registers off of generators. About day two we decided to go just to check it out and they were out of a great many items already, with lines to the back of the store. No bread. Cold goods were no longer available. No meat or milk or butter or yogurt or any of the things my kids like to eat. We left with the relief of knowing we weren’t dependent on a store to provide for our needs. Fortunately, we still had water – that is a huge thing. I was able to cook and the first three days we feasted like kings as I cooked up as much as I could on the grill from our deep freezer since it would all be going bad. Those first three days were the easy days and since I was prepared, the remaining days weren’t difficult either but had I not been prepared, it could have gotten iffy. That was only a week, imagine if it had been more. This is only one scenario, imagine if it had been something else. We have a tendency to think we’re immune, but turn on the news and you’ll see that situations like this occur every day. Hurricane Katrina, Hurricane Sandy, massive tornadoes in states around the country, and back when I wrote this post an entire town in Georgia had someone break into their water treatment plant and the EPA shut down all water to the entire town for four days. Recently, towns in Ohio and Michigan along with many others have gone through similar water crisis due to contamination of different sorts. Shelves have cleared out in these towns within hours. Now lets get beyond natural disasters to more predictable threats: war, pandemics, the economy. Just last week the CDC issued a memo to all hospitals that stated “The time to prepare for an Ebola pandemic is now”, exact quote. The name du jour of Al-Quaeda has said openly and repeatedly that their ultimate goal is eliminate as many of us as possible. Already this year, many countries have dropped the US Dollar as their reserve currency, leading to an even greater devaluing of the money in your pocket right now. Combine that with the rising grocery prices (over 50% price increases in some cases) and other living expenses and don’t forget to stir in lack of jobs with an already dismal economy. I realize news reports contradict this and state that the economy is strong, recovering, etc. But step outside of the tv and look around you. How many people do you know who can’t find a job right now? I know many people who have given up. Still others, who went from making family supporting incomes to being pounded to the level of being grateful for minimum wage. How many families do you know that are not struggling to stretch their grocery dollar right now? Reality and news reports don’t always match up. The power of discernment is a tool not to be underestimated. So is it really crazy to have some food put back in order to be able to take care of your family and shelter in place should an emergency occur? Is it really crazy not to live in a way that requires you to go to the grocery store every few days or else not have food? In times of disaster, the first things to disappear from the shelves will be what you need the most to survive. Is it crazy to have some medicine, water, food, and other needed items that you know you will use anyway stocked up a bit should you be unable to replenish your supply on a regular basis? Is it crazy not to? Absolutely. At no time in American history have citizens been so lax in being able to take care of themselves, so dependent upon “the system” should disaster strike, and so lulled into thinking “It will never happen to us.” Our ancestors would be appalled at our opinion that the welfare of our families is someone else’s responsibility. Now think about the power and water being shut down for a week and you being able to just shrug if off because you know you have water, food, and all other needs put back for just such an emergency. Rather than rushing around trying desperately to find water and meals for your family, you can sit back and pretend you’re camping for a week. That is the difference between being prepared and not being – and it could very well be a life saving difference. Here are a few necessary steps to being prepared for any disaster in the short term. AGAIN This is not meant as a guide on HOW to prepare, it is meant as a springboard to get you thinking and developing the best plan for you and your family. I am happy to answer specific questions in more detail in the comments on this post. Rule #1 – Be your own hero. This is the absolute most important rule in disaster preparedness. Plan to be your own hero. So many people think “Oh if something happens, someone will come. Someone will show up with food/water/generators, etc”. While the rest of us put our plans in place, we make the mistake of thinking those who don’t, don’t have a plan. That’s simply not true. Their plan is what I call “Big Daddy On A Horse”. Big Daddy (Fema, Government) is gonna think “OH my goodness! The Smith family in Arkansas is right in the middle of that! I bet Betty Jean didn’t even buy groceries last week!” and charge off directly to their house with free food, supplies, cell phones, and gift cards. I don’t know about y’all, but the only time Big Daddy on a Horse thinks of me by name is when I owe him money. Eventually, this might happen but keep in mind that your area might not be the worst off and even if it is – those who ride in on the white horses take time and are preceded by an unimaginable amount of paperwork and red tape. When the tornadoes hit our area, we lost over 400 houses. Of those people who lost their homes, most of them lost their cars as well so they were stuck without transportation and no shelter. Fortunately, many of them were prepared to an extent and we had a wonderful leader in our community who mobilized all available local help to address the situation. On the very next day after the tornadoes our ambulances were turned into food delivery trucks and the community center set up as a hub where folks were cooking on grills and generators to deliver food into any neighborhoods who needed it. FEMA showed up seven days later. Thank goodness for community because that is one of two things that will save you and your family should you need it. #1. is you #2 is community (if you’re lucky). This was a rare situation in which we had a great leader who acted on common sense and did what needed to be done without taking time to consult a committee. Unfortunately, many communities aren’t like this and you may not know what yours is like until it’s down to the wire. No one is guaranteed help when they need it and there are countless reasons why it may not come until a week or more later, or not at all. Imagine being without power, food, fresh water, and shelter for a week. Now imagine a month. This is not as far fetched as it sounds. It has happened to many people. For a bevy of reasons, it will happen to more. There are countless resources on the internet and in bookstores to help give you a good overview of what to do in order to prepare you and your family and I’m going to remain purposefully vague on that because I’ve found not a single one of those books can be applied perfectly to everyone. They will all go into specific lists of things you need but if you followed any one of those guidelines to the letter you’d end up wasting a lot of money because any plan has to be tailored to your specific family. I do suggest you read one or two of those books and then think about your own family. Most books will say you need to be prepared for 1-3 months, some up to a year or even more. If you’re just now starting off, I suggest you make a goal of being prepared for a full week. That is a week’s worth of water, food, lighting sources, personal hygiene, etc. Then, work up to a month. From there, you might want to go to three months or even more. If you think about it, there are many things you can do to make your family far more self sufficient in some areas for the long term while enhancing your daily life now. This is a very important factor. We take for granted that our faucet will provide all we need but what happens if a natural disaster or other incident leaves that water cut off or undrinkable? Back around the time I wrote this post, someone broke into a water treatment plant in Georgia intent on causing harm. While the EPA investigated, water was shut off to the entire town for four days with very little warning. Stories like this have become common lately. Ohio, Michigan, and many other places have had water shut off due to contamination and other incidents. Most likely, everyone in those towns thought it would never happen to them, either. The one thing most books seem to suggest is one gallon per person per day and I really encourage this one. However, I have found that gallon jugs of water aren’t the best for long term storage. They tend to leak and evaporate over time. Also, containers that once contained milk or juice aren’t fit for waters storage due to bacterial residue issues. You can use these to store “gray water”, which is water used to flush toilets and such, but not for human consumption. If you use them for this, be sure you clearly label them as such. Instead, I save 2 and 3 liter coke (you may call it “soda”) bottles for this. I rinse out the bottles with hot water and then sanitize them by filling halfway with water, adding a teaspoon of bleach, putting the lid on it, giving it a good shake, then rinsing again. By using two liters, it is easy to slowly build up your water supply. When I fill them with water, I add a few drops of plain bleach to make it safer for long term storage (I suggest checking out FEMA or LDS guidelines for how much to add – more on LDS later in this post). I come by two liters easily because I switched from canned drinks to those, but if you don’t drink cokes you can just ask someone who does or purchase all of the two liters for a party in exchange for taking the bottles back when they are empty (I’ve done this a few times). 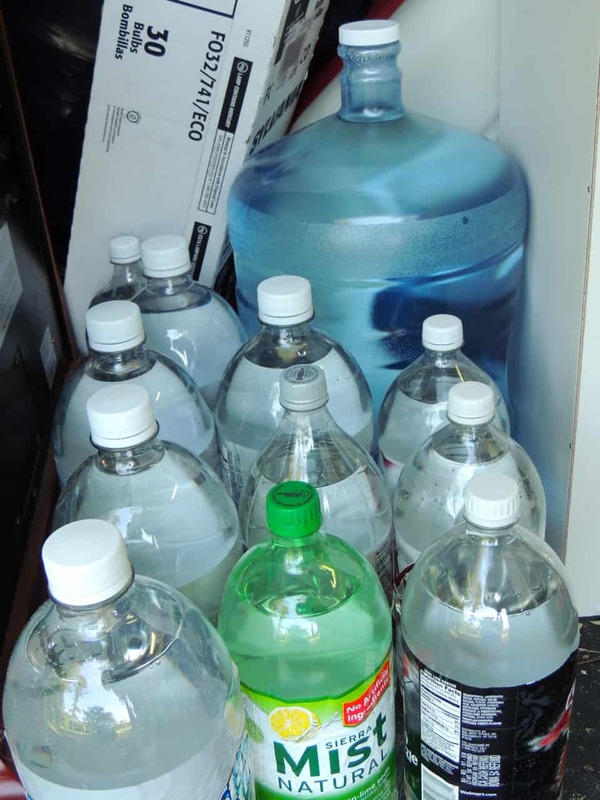 You’ll also notice that the two liter bottles are far more durable than the jugs that water come in and make much better long term storage units. My favorites of all time are three liter coke bottles from the Dollar Tree. I sometimes buy them, pour the coke down the drain (it tastes awful but helps unclog drains!) and then wash out the bottle to use for storage. The neck is larger than that of a two liter so once they are dry you can easily use them for water, rice, or even dried beans. They are an especially well made plastic that is BPA free. For $1 you end up with a mighty fine dried food or water storage container. Please note: Water doesn’t go bad but it can begin to taste stale after a while. Personally, if I need water and it tastes stale, that is not going to be a deal breaker for me. However, for some people it may be. To help restore the flavor, pour water that has been stored back and forth between two containers several times before drinking to help oxygenate it. Another option is, once a year, to water your garden with all of your stored water and refill the bottles with fresh. Where to store it? I find a great place for storage is behind my couch in the living room – between it and the wall, under beds, or in the garage. Look for other underused areas in your home – the bottom of guest room closets, the bottom of your pantry, etc. For the big dogs –You can purchase a 55 gallon water barrel to store, filled, in your garage. Many of these come with water pumps as well to make getting it out easier. For most folks who are just looking to prepare for a short term emergency, this will be too costly to consider. Note though that a 55 gallon water barrel is still just shy of two weeks worth of water for a family of four. There are bottles of water treatment you can buy on Amazon to add into these barrels to ensure the water is safe to drink for up to five years. A lot of folks have the idea that should a water shortage or tainting even occur they will just fill up their bathtubs and have plenty of water. That is a good plan, provided the water is not already tainted or shut off. In other words, that isn’t really a backup plan. You will need water to : cook, bathe, brush teeth, DRINK (don’t forget tea and coffee), and generally to live. Important to remember: You will need at least one gallon per day per person, that’s mainly for drinking. Allow more for bathing, cooking, and flushing toilets. And remember, water doesn’t go bad. It may taste stale after a time but it is good indefinitely unless it becomes tainted. Food is a primary concern and countless companies exist whose sole business is to sell shelf stable items for disaster preparedness. Most books will give you a list to go down but I’ve found those to be highly tailored – to someone else’s family. For example: If your family doesn’t eat broccoli, 5 gallons of freeze dried broccoli is a waste of money and space no matter how good of a deal it is. This is a time of disaster, not a time to try to encourage culinary experimentation and fortitude. My best advice is stick to what you know and start close to home. Save your money and go to the grocery store first – There are SO MANY great options at your grocery store so don’t overlook your children’s favorites. I know these may not be appealing to all of us and you likely don’t want a diet comprised entirely of them but in a time of emergency, familiar and easy are important and for many families, these just might fit the bill. The drawback of these grocery items is that you do need to rotate them on a regular basis in order to avoid something going past it’s expiration date, but if you buy things your kids enjoy eating and put them in a special place and replace every six months to a year you’ll be fine. Also determine ahead of time what your view is on expiration dates. This is a personal decision but I generally double all expiration dates in my head on canned goods and dried goods perhaps even longer, depending on my best judgement. You will need to rely on your own judgement here. Another great option are Shelf Stable meals. I cover these and give lots of recipes in my Bags To Dishes post. Click here to read that and see links to my Bags To Dishes recipes. These are food items recommended for short term preparation – if you are preparing for a few days up to a month. If, after investigating the possibilities and expanding your knowledge of disaster preparedness, you decide to plan for long term, you will want to look into foods with an even longer shelf life. Oil lamps are handy to keep on hand in case of power outage. Be sure you get oil that is labeled for indoor use. Drain and clean them once power is restored. After the tornadoes, we adopted farmer’s hours, rising with the sun and going to bed when the sun went down. This saved us from having to worry too much with lighting the house after dark. However you’ll want some options for this. *Short term – flashlights work well so get a few and make sure you stock batteries. *Long term – I prefer a few oil lanterns and some tea light lanterns for the kids. Young children will be disconcerted by the lack of power, quietness of the house, and extreme darkness of their room which they are probably not used to (most of us have at least one electronic device giving off a small amount of light in our bedroom). I have a few camping lanterns which operate on tea lights and are designed so that the tea light goes out if the lantern is dropped or turned over. A tea light generally burns 8-10 hours and they are very inexpensive. Pick up a few tea light lanterns and some candles and your children will have a better peace of mind in the midst of an emergency. 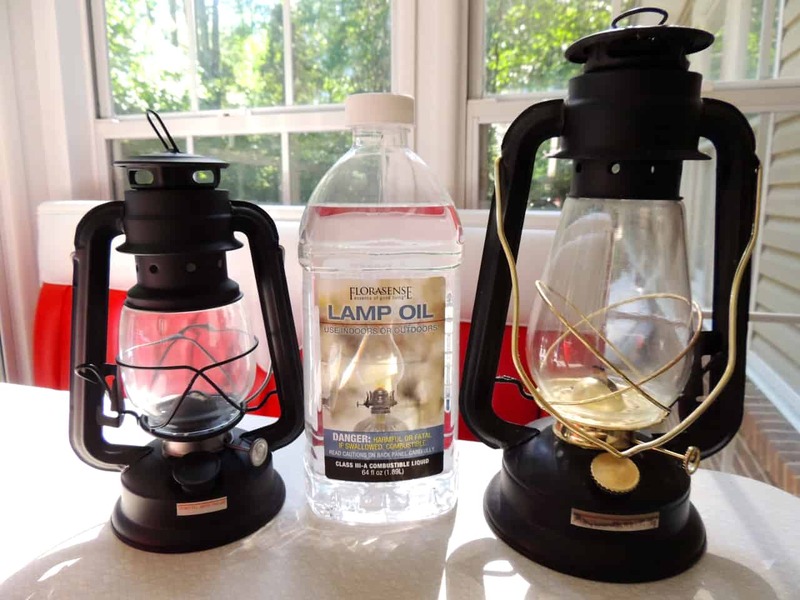 *When it comes to oil lanterns, don’t forget to stock up on oil and wicks. This is a link to a wonderful cold blast oil lantern made by Dietz that I love. I have two right now but plan on getting more. They are beautiful, too, so I just use them as decoration in my kitchen. I’m sure you may have other options and I encourage you to do whatever works best for you and yours. After the tornadoes, even with the power out, we were still able to use our telephones to access the internet, read the news, etc. We charged them in our cars but a lot of people no longer had cars (the tornadoes either destroyed or toted them off) so it is best not to count on a cell phone being usable after the initial battery runs down. A battery operated radio could save your life in the event of a string of tornadoes and can also help you to keep updated on how the emergency is being handled and what to expect. Again, a battery operated radio is nothing without batteries. This is another great option that I have: A solar radio that can be charged multiple ways, has a built in flashlight, and can even charge your cell phone once it is charged. Most folks reading this probably have gas heat, a fireplace, or a wood burning stove of some sort. We do not. Fortunately, we also don’t have really cold winters, either. Still, a contingency plan has to be in place for us to be able to comfortably stay in our home during a power outage should the temperatures drop. I have a Big Buddy propane heater that runs on those small bottles of propane that you can get in the camping department. I buy them during season changeovers when I can find them on clearance. Just last week I paid $2.50 a bottle for bottles that are normally $6.00. This heater has a safety off switch, oxygen monitor, and can run for an entire night on one bottle of propane. It won’t get the entire house toasty by any means, but can make one room (400 sq ft) a whole lot more comfortable for the four of us. Combine that with a few of my Dietz lanterns, which also give off heat out of top vents, and we can ride out a lot of weather. You should have any prescription medicines and over the counter medicines that you commonly use on hand. If you’d like an additional month’s worth of prescription meds to have on hand, ask your doctor. The last thing you want to happen is to be iced in or sheltering in place due to an emergency and have a loved one run out of medication that is absolutely necessary for their health. I like to keep a supply of cold remedies, cough medicines, and medicines for ailments common to my family as well. If you decide to look deeper into this you will find that it is also possible to have antibiotics on hand for different illnesses should the need arise. I could write a book about all of the items needed to be truly medically prepared for any disaster, but someone far more qualified than me has already done that. My mother says this is the most important thing I have ever taught her! During the tornado aftermath, it was difficult to get gas. Most of our stations were closed due to lack of power to run their pumps and registers and the one or two gas stations that were able to open had lines so long that folks were urging people not to go get gas because you’d use more gas waiting in line than they could allow you to get at the pump. This made evacuation impossible for many people. For this reason, I never let my car get below half a tank. Most of the time, it is hoped that adults will handle these situations better than kids will. Therefore, children require special consideration when it comes to preparing for disasters. A simple box with candy, board games, a deck of cards, and one of those lanterns I mentioned earlier can make a world of difference. With Halloween coming up, consider shopping the clearance aisles once November has hit to add a bit of candy to this stockpile as well. Percolator and Coffee – This is something that may not apply to y’all but definitely applies to us! I did not have a perculator during the tornado aftermath so I used a cast iron pot to heat water with coffee grounds in it and had cowboy coffee each morning. Get coffee grounds in your mouth? Just chew! 🙂 Now I have a perculator but we don’t always have coffee grounds on hand (we use a keurig) so I’ve opted to add instant coffee to my supplies. It is freeze dried already, just ready and waiting for long term storage! Now, I’d definitely rather have brewed coffee than instant but we do what we gotta do and instant beats nothing. Some folks put back green (unroasted) coffee beans for a situation like this but when I’m in a hard place in life, the last thing I want to do is set up roasting my own coffee. A French Press is another option that I have now. I even added a hand crank grinder and a small assortment of beans, just in case. Matches – This seems like a no brainer but is often overlooked. A package of six small match boxes cost a dollar at the grocery store near my house but would be worth more than gold bullion should they ever be needed. Spend five bucks and stock up. 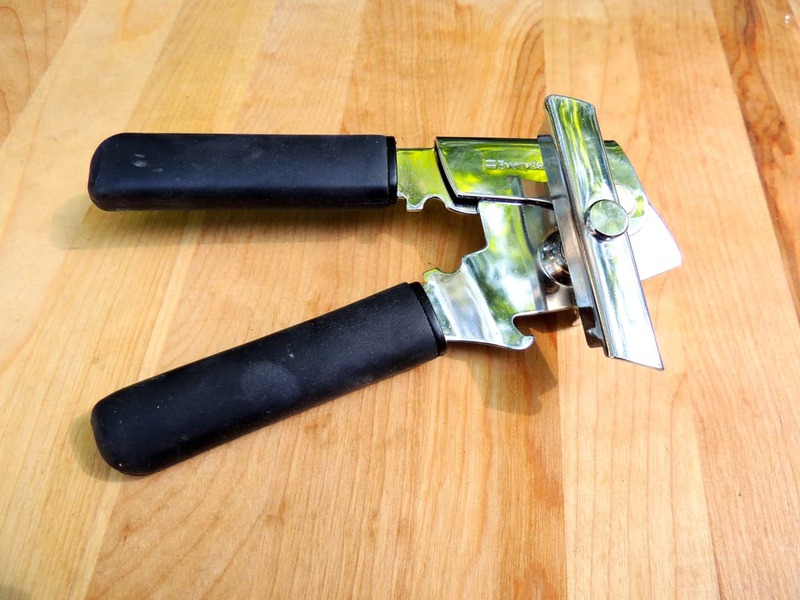 Manual Can Opener – This is so very important and from what I’ve seen, the #1 most overlooked item to have on hand. If you have an electric can opener you likely don’t think about having a manual on handy. I can’t tell you how many times folks have been stuck with all sorts of wonderful canned goods and had to get really creative in opening them. This one opens regular cans and the sometimes more stubborn #10 cans. As I said, this is NOT a list meant to be all inclusive. This is a list meant to get you thinking and inspire you to do further research and thinking about how to best prepare your home and your family. *Do not plan on someone else preparing for you – I have a friend who told me the other day that if a disaster struck, they were coming straight to my house! I told them they’d be welcome the first two or three days while I emptied out and used up the freezer, but after that we’d send them on their way. Not to be inhospitable, but if I work and prepare to take care of my family, I can’t work and prepare to take care someone else’s, too. This all goes back to rule #1: Be Your Own Hero. It is easy to see that someone who is prepared to take care of their family of four for a full month will be lucky to last a week if friends and neighbors show up. We want to be neighborly, but if I’m prepared for my family to last a month with any help, I can easily stretch that out to two months if need be. If additional people are planning on me supporting them with the rescources I’ve put away for four people, I could be depleted in a week. For a greater understanding of how this works, see my Little Red Hen storytime video. No, I’m not kidding. Sit back and wait on Big Daddy. He’ll get to you…eventually. *Do not plan on the calvary (ie. Big Daddy) showing up at the first sign of distress – The number one thing I do not expect is for an alert to be sent out across the nation just for me. I realize that if disaster strikes or an emergency happens, my family will be one of many affected. As one of many, the response begins with me. See Rule #1. There will be others, you may not be the worse off (no matter how bad it is) and reaction time will be slow. If you are not prepared with food, water, and supplies for your family for a week or more, then you need to be prepared for your family to go without food, water, and supplies for a week or more. In other words: Those who fail to prepare need to be prepared to fail. *Do not overlook things that will give you peace of mind, even if they seem irrational. Peace of mind in a storm is a precious thing – For me, this means camping lanterns and an abundance of candles so my kids don’t have to go to sleep in a dark room. It means dried beans and canned comfort food and a weather radio. It also means a car that never has below half a tank of gas. I also like having a book like this handy: Storey’s Basic Country Skills: A Practical Guide to Self-Reliance which teaches you everything from pretty much how to build a house to hunting and preparing wild rabbit. I know this is a bit of a stretch for folks only interested in short term preparedness but it’s an interesting book regardless and well worth the money. The LDS Church – the Mormons are encouraged by their church to be prepared for emergencies and they have wonderful resources which they make available to the public. They’ve done all sorts of research on how best to store food items, what is needed for a family to be prepared, and more. Most, if not all, of this is available online. Whenever I have a question about how best to store an item or whether or not a certain item is a good idea for long term storage, I immediately look to see if the LDS church has a suggestion on the matter. They are the experts here, and you’ll find that they’re very generous with their knowledge. Prepper Blogs – I could spend all day reading prepper blogs and forums. The offer such a wealth of information. Google around until you find a blogger or website that seems to speak to you and see what they have to offer. Again, it is up to you to decide how long you want to prepare for. FEMA recommends that everyone be prepared for at least three days. In my opinion and from the disasters I’ve seen lately and what is coming down the pipe, three days isn’t even a drop in the bucket, but it is a good starting goal. I suggest starting with a week, then moving to a month, etc. How much longer you prepare for beyond that is a decision you’ll need to research and make based on your own needs and beliefs. Sanitizing Agents (bleach, pool shock, antibacterial gel, lysol, etc.). Pool shock is much better than bleach because bleach loses it’s effectiveness after a few months but pool shock can be mixed up to make bleach and keeps indefinitely. I have the link to my instructions on how to do this on this post. I’m Overwhelmed! Where Do I Begin? Bag Meals are shelf stable meals that you can assemble ahead of time in individual bags. Whenever you need a quick supper or a meal you can prepare without the aid of refrigerated foods and items that spoil quickly, reach for a bag meal. You can easily make a month’s worth of bag meal suppers and store them in a plastic storage bin until the need arises. Read my introduction to bag meals by clicking here. The original Bags To Dishes post has instructions on turning your family’s favorite meals into Shelf Stable Bag Meals as well. Shelf Stable Milk – good for up to 2 years, perhaps beyond. Oats – I get 10 pounds for around $7 at Sam’s. This is one of my personal favorites to store because they are so versatile. Breakfast, dessert, cookies, cake, etc. Lots of options with oats. Freeze Dried Foods – the cadillac of food storage. 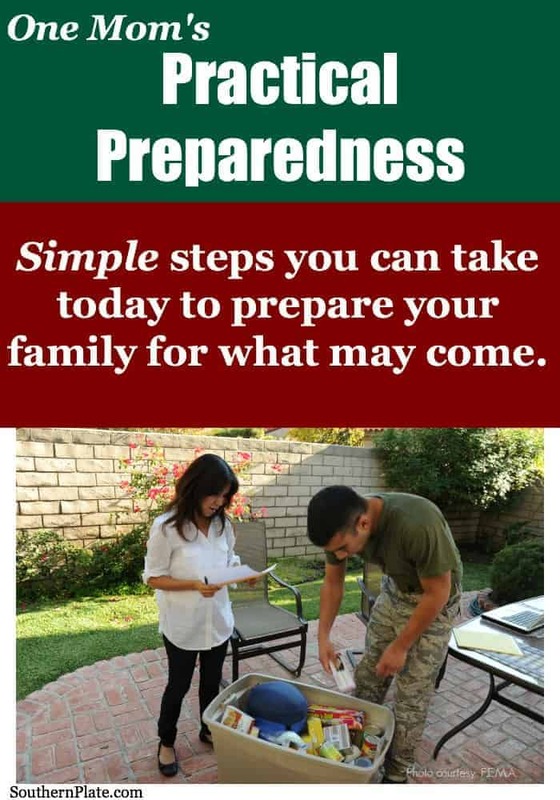 I hope this post will get you thinking about practical things you can do today to help prepare your family should the need arise. As I said, I have purposefully remained vague so that you will investigate, think it out, and start moving towards a plan for your family. I’ve read many books on preparedness and considered many scenarios when working towards my short term and long term plan. If you have a specific question you’d like to ask me, feel free to do so in the comments below and I’ll be as frank and helpful as I can. Please refrain from political talk. There isn’t much good on either side of the fence at this point anyway and arguing amongst ourselves wastes valuable time we can spend being helpful. I want to reiterate once more that this post is only meant as an introduction to preparedness to help kick start your thinking. Because of that, I have kept this purposefully vague in some instances. However, if you have a specific question please feel free to ask it in the comments and I will be happy to answer it as fully and frankly as I can. You and your family could end up in severe distress after a disaster because simple preparedness steps were not taken. You’ve bought up some extra candles, food, and cooking utensils. So you light a few candles every now and then, eat some of your pantry stock, and use your new pot! To listen to my podcast answering a lot of the questions asked on this post, please click here. To see my instructions on how to make a DIY $20 Survival Food Bucket using items you can get locally, click here. When disaster strikes, the time to prepare has passed. Thank you for such a wonderful post. This is a subject that has been on my heart for some time. I’m taking this as another nudge from the Spirit to get busy! I appreciate you! Thank YOU Vivian! I understand exactly what you mean. Sometimes God puts it on my heart to make like an ant and get busy! I appreciate you, too! Christy, can you delete my last name from my comment near the end of today’s post? Happy to! 🙂 thank you! I will be posting it soon keep a look-out for it. Thanks for reading and for the great input, Judy! Yes, the one gallon per person per day is definitely a minimum, that is a survival amount. Cooking, hygiene, and even just enjoyment (glass of tea!) will require more. It is frightening to think of how many people don’t even have the one gallon per day right now though. I’ve even read about canned goods that were 100+ years old being tested and found safe to eat, even though the quality of the food was certainly not the best. I look at expiration dates as a guideline but of course I can’t make any firm recommendations on that here so I just encourage folks to make their personal best decision. Thank YOU for your encouragement and great input! Thank you for the reminder. I live on Long Island and we had 12 days with no power after Sandy. Living in area with no gas mains, we are dependent on electricity – for cooking and running our oil burner for heat. I hope to never be as unprepared for such a situation again. Great tips on some items I didn’t think about previously. Mercy! You were in the thick of it! Glad you are okay now! Great article! Thank you, Christy. I would like to hear more about making bleach from pool shock. Hey Sue! I have a document I typed up with all of the information in it to make bleach and then how to purify drinking water along with some other helpful information (I think it’s three pages long at this point!). I just emailed it to you. If others are interest, I may just edit it a bit and post it on SouthernPlate next week to share. I would also like it! Thanks again. I guess a question that I have, if no water, how safe is the creek behind my house? the creek behind your home is very likely contaminated even high mountain lakes in Colorado have been found to be full of giardia, critters drink from it, and lord knows what bathed in it let alone did other unspeakable things. If you filter the water and boil it or treat it with iodine or bleach it could be safe, but never drink straight from a stream or creedk unless you know for sure it is clean, even then I’d think twice, the last thing you need when there is crisis in your area is to get sick from bad water. Good article! Hope it will get more interested. Yes please, publish the pool shock water purifying info. What a blessing. Thank you again. Wow, bless your heart! I think we all have in at least the backs of our minds that the times we live in are perilous at best, and they are not going to get better (not on this side of the “river”, you know?). I might add in some board games, cards, and non-electronic “fun” things and, of course, a Bible (or whatever your faith tradition holds dear). We are going to need all the help we can get. Amen, Amen! I do feel that God has put this on our hearts for a reason and there are so many people who keep saying the same thing. I would also like to have this article. Thanks so much for this reminder of being prepared at all times. I’d love the article as well. I would love to see these instructions! I would love to see the article on making bleach and purifying water also! I’ll get to working on cleaning it up a bit this week, right now it’s just a document I compiled for myself and my family, and get it posted for all of y’all next week. Look out for it! As always, you are a blessing and inspiration. Please publish the pool shock filtration. I am beginning preparations this weekend. Ordering books today. God bless you. I am interested in this information, too! Once again, Christy, I am so appreciative of all you share with us! That would be great, cause I’d like to see that too. Christy I would like the info on water treatment with pool shock. I have subscribed to your blog for years so if you post I will see. I also have and love your cookbooks. I have survived 19 days with no power when Hurricane Rita hit the Texas coast. I definitely believe in being prepared. I also have some Thrive freeze dried products stored. I’m sure water is my biggest shortage. I really enjoyed this post and will be ordering mini lanterns – thanks for link. I would be interested in the pool shock-to-bleach instructions, as well! I concur with everyone else, thank you! And I couldn’t agree more about personal responsibility and being your own hero! It just amazes me how many momma’s I run across who never consider just how they’re gonna take care of their babies in a prolonged crisis situation! Appreciate so much your clear and practical approach to this subject that is on so many people’s hearts and minds. I also would like your purification with pool shock article and I also second that Bible being in anyone’s preparedness items…for that is the most important thing anyone needs to be prepared for….not to mention God’s great care and encouragement contained on those pages! Also, can one dehydrate chicken? Today I am battling cleaning and seasoning new but rough cast iron cookware. Almost done and ready to cook! Love your bag meals concept too- I’ve been looking for just such an idea. Hope you post the water filtering/purification info soon. How much shelf-stable pool shock do you buy? My burning question is: If you wanted to make up your own gallon of “regular clorox strength” solution for disinfecting in an emergency, what would be the ratio of pool shock to water and how do you figure it so I could make smaller batches? Thanks! I will be posting it Anne!! Thanks so much for reading, Diane! Hi, I would like more information on using pool shock as a bleach alternative. Thank you for the great starters! Like the previous comment, this has been on my heart for several weeks. This is just the extra nudge telling me I’m not crazy to want to do this! So glad to see I’m not the only one who has felt the tugging in my heart to start getting prepared. It was so overwhelming on how to start and I felt like a lot of the prepper books were so extreme. Christy’s article has calmed my heart and given us a great place to start! Hey Michelle! I’m so glad you found it helpful. I’ve read a lot of the prepper books so I know what you are talking about. Something like this is so personal and really needs to be so very individualized that a mass covering in a single book ends up just not working for the majority. I am so glad this offered you some comfort! This is an excellent post! Even the Boy Scouts stress to be prepared. As it has been said, “Prepare for the worst and hope for the best.” Thanks, Christy! This is great info ! We may have questions later, but this is excellent. We have been “preparing'” but this is organized and very helpful so we can expand our resources. I greatly appreciate your suggestions and the time you spent collecting all this information. Most of all, thank you for sharing it ! What a wonderful informative article. Having gone through several hurricanes, I know exactly where you are coming from. The first hurricane my husband and I had hit our new home(at the time), we were at the National FOP Convention in VA. Having received word that the hurricane was headed our way, we left to get home. We had not slept and was bone tired. We started trying to find a motel and could not find a room as everyone had evacuated from our area and all motels were full. Thankfully we called a friend in Montgomery knowing he and his wife was up getting ready to go to work. We asked if we could possibly crash for a few hours at their house before coming on home. Another friend in Montgomery had taken it upon himself to find us a generator to bring on home with us. Needless to say, we were not prepared for what happened here but with the help of friends, we survived. Ever since, I try and have some of the staples that can be used without our normal elec, gas. I make sure I have can goods that can be eaten directly out of the cans. I say all this to say this … you have some very good ideas and I do intend to put some of them in my pantry. I especially like the 3 liter bottle recommendation. I will be doing that and soon. Thanks Cristy for your finally putting this out. If people will prepare ahead, they can get through anything. Thanks for the wonderful article! We had just over 24 hours with no power last winter, and we breezed through that, but I took it as a gentle reminder that we needed to better prepared. I’ve worked over the summer to increase my stockpile, but you’ve really rounded it out and given me so many ideas! I would love to have the information about making bleach from pool shock. Thank you again for sharing. Christy, could I have your permission to share this article on my FB page with family and friends? I will understand if you say no. Christy, This is also something that has been in my heart lately too. Thanks for the latest nudge. This summer, visiting (a long way from my home) in a predominatly LDS area, I ran into Walmart and saw all the prepared packages that were specifically on the shelves for LDS prepardenss. Each one came complete for a specific period of time and a contents list. It was eye opening. There are just the two of us, so this should not be too onerous, but I figure I can add to it as necessary. Thanks Christy! I think it is a brave thing for you to bring up this topic. So many people think someone crazy when they talk about being prepared. Our ancestors took care of themselves, never expecting someone else to help, we have fallen way too far away from that! I feel that as a mom it is my job to make sure that my family can eat… whether in good times or in bad. So I have a very large pantry, along with some long term items in storage. My sister-in-laws give me a hard time about it but I almost always have the one item they need to finish preparing dinner. I agree! An excellent post! I too would like to get the information you have regarding pool shock. I have done a little research but decided I wasn’t ready to figure out how to store and use when needed. I live in West Central Fla.and I survived the storms that blew across the state in 2004,and saw firsthand what can happen in one day.We were fortunate that we didn’t lose power but neighbors a couple miles away from us were in the dark for a month.I worked at a grocery store where the power was out and the stuff we had to throw out was astounding. (The state health dept.had a mandate if the power was out over a set period of time the items had to be disgarded. )So we had to throw out meat,dairy,frozen,refrigerated,deli,bakery and produce items and then break down coolers and clean them. (loads of fun…)I remember folks who had to buy food on a dayby day basis cause they had no power to keep stuff over a day.Some did this for weeks. I now work at Walgreens.We have flats of water on sale for $2.99 for 24 bottles on an almost weekly basis.A few of those stashed in a corner or in a shed or garage would keep you in water for long enough to matter.Peanut butter and jelly goes on sale everywhere as does tuna fish and other canned items.Ramens are dirt cheap almost anywhere and can be cooked just by adding boiling water to them in a bowl or cup. Thankfully we’ve dodged hurricanes more or less for the last several years but we never know when they might turn up another again.We do get the rain off the occasional one passing by tho and some places get good and proper flooded.Meaning you can’t drink the water for a few days and all that water will come in handy.Gotta be ready. I have been “prepping” for a little while now by dehydrating food. My one-bedroom apartment is too small to store canned goods, and dehydrated food could be rehydrated without heat source if necessary. It is also very easy to transport if I were to have to leave my home. I live alone, and hardly anyone knows that I prepare for emergencies. The information you have shared about dehydrated food has been very helpful, thank you so much. I have been unsuccessful in conviencing my adult children how important it is to plan for what is coming down the pike, so I am trying to prepare enough for them as well. I use an Excalibur dehydrater, and also two smaller round dehydraters. I believe in God’s protection, but He gave me a brain and expects me to use it. I hope your article inspires others to prepare. Thanks for all you do. I’d love to have the article on bleach as well! The Holy Spirit has been whispering to my heart as well to watch and be prepared. Here in Kansas we have everything from tornadoes to destructive ice storms. We’ve been without power more than once around here. So that, along with the state of the world economically, and groups who are just out to get us….how can I not be prepared? My son has a brain tumor and multiple endocrine issues that require lots of medications and hubby is diabetic. I’m going to talk to the doctors and see if I can get three month supplies on their meds. That way we will have more on hand at any one time. Great idea about storing water in coke bottles! The milk type jugs sometimes even leak on my way home from the grocery store if they fall over. Wondering how sealed they really do get. Eww. I’ve been watching your videos on dehydrating foods so as soon as I find a dehydrator, I will be starting that up. Thank you so much for your post. I’ve been overwhelmed on how to start prepping and this was honestly a God-send! 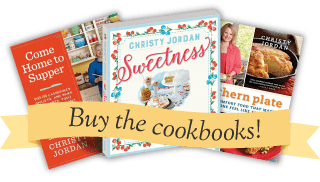 Love your recipes and stories. From one God-fearing Momma to another, thank you! Living on a farm for 16+ years we’ve seen our share of power loss events. Water is always our biggest issue. I want to thank you for the information and even more so for also keeping the balance- your devotionals remind us that no matter what the news reporters say, and no matter how prepared we may or may not be- God is still in charge and we need to keep our eyes on Him while we go about our lives, living our principles and preparing for whatever may come. Great post. I must get started! Thank you for sharing this post, Christy! My family and I have been managing our water supply and shelf stable food items for over a year now. We have purchased some LDS food items from a local cannery, have been rotating our canned goods (both from the store and from preserves), and have worked on our first aid kit, hygiene kit, supplies for alternative heat, etc. We are only a family of three, but we live in a very rural area in Tennessee and know that a small emergency could be a big deal for us. I have followed your bag meal recipes (which I love) and have realized that even though I have all these items “prepared”, I still depend on allot of perishables in my daily meals. My next goal is to ensure I have more shelf stable – completely – recipes at hand. It is great to be able to fellowship and gather wonderful information from folks like you who love to share! I also wanted to mention that, as a Girl Scout Leader, my Cadettes are putting together Emergency Preparedness Videos focused on what children can do themselves to be better prepared for emergencies. They are also making emergency kits to put in their purses or backpacks when they are away from home (made from a pot holder and baggies!). They will present their projects at the local Emergency Preparedness Fair in May 2015 to qualify for their Silver Award! We need to educate ourselves and our children more and be less dependent someone else to provide for us! Thank you so much for this post! I am taking it as a nudge from Him to get busy. Can’t wait to see your post on Pool Shock bleach. God has been impressing the word “prepare” for a while now. This article is just another confirmation of His seriousness. I will be forwarding this to my adult children. I agree completely and appreciate you confirming that for me! Great ideas! Gonna get started! Thanks for sharing. I have lived through major earthquakes here in California so I truly appreciate your excellent post! I think gas in the car and water are the two most important considerations. Last year my friend and I put together emergency preparedness kits for our families at Christmas and they were accepted well. We included 25 one dollar bills just to remind them that when the electricity is out cash registers and ATMs stop working. Cash may be needed when the store owners set up shop outside their store and you need something like batteries and water. Thanks for reminding us about getting/staying prepared! That is such a thoughtful gift! Last year I made bug out bags for my parents, completely stocked with food, water filtration bottles, some water, survival items, makeshift shelter, custom medical kit, and several other things. I could write a book about what all I choose to put in those bags and why! On the outside pocket, I always put cash and a box cutter and tell folks “If something happens, open that pocket and put those two things on you first thing. Please do write that book! Your ideas are always wise and helpful. I appreciate this entire post and everyone’s comments. I am working on this preparedness thing and am grateful for all the suggestions. I have felt the nudging and your post strengthened that into action. I’d be happy to do one!! They are WONDERFUL things to have and cone in handy daily for us. Thanks! I would love to give “bug out bags” to my kids for Christmas, could you post your list of what you put in yours?? Just a thought, I was reading great posts on “thermal” cookers last week, you can make your own, and it will allow you to prepare food, full one pot meals, for your family with only ten minutes of boiling time, thus saving lots of energy when fire or heating sources are limited. Many thanks for this article. Hopefully it will help me get motivated. We really got into prepping after an ice storm in ’98 that left us with out power for eight days over Christmas no less. We were fine on everything but gas for the generator. Now we stockpile gas with Sta-bil added. I will not provide for my neighbors who chose to not prepare. I am not their white knight! If I can do it so can they! Amen! I do keep a little gas at my house as well and we also use Sta-bil. I set a reminder on my phone a month before the gas is due to be replaced so I can remember to use it rather than waste it. It is heart wrenching when others choose to take the route of letting everyone else care for them, so I just remind myself that it is their choice to make – and live with. Excellent post! God has definitely put this on our hearts as well.. I can’t tell you how many folks we know who are thinking the same thing. We have found the Dollar store to be a good resource for things like gardening gloves, seeds, small tools, candles, and matches. And don’t forget clothes pins! I appreciate all of the helpful comments here and will continue to do what we can. Thank You all of this valuable information. We all need to be ready for most anything these days. Thank you Christy for all the work in gathering the info & posting it for us. Fortunately, my husband & I have all of those things ready. Last year alone we had five weather-related electrical outages & lost a lot of freezer food. We want to get a generator when we move next year (Lord willing.) 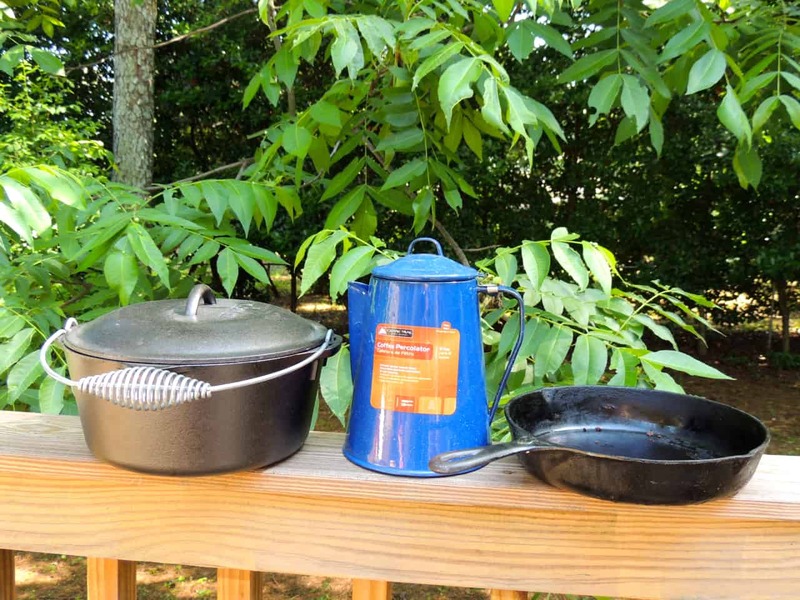 I have a camp stove, fireplace, old-fashioned coffee pot that you boil coffee in like grandma used to make on her coal stove (one morning I set the pot on the fireplace grill & made coffee–delicious) , battery radio, oil lamps, camp lantern & other supplies. Both of us have chronic diseases so we try to keep 90 days of meds on hand. Another idea is to have a place to go to in case of tornadoes–storm shelters, etc. We have a basement & we have gone there a few times over the years. We don’t have many tornadoes here in Virginia but some of the storms are brutal. We also keep some money on hand. In these days of troubles everywhere it does pay to be prepared. Thanks again for caring.